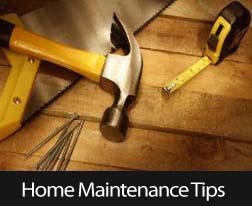 The calendar has turned and with that we receive less sunlight, colder temperatures, and shorter days ahead, it’s an opportune time to cross those last-minute maintenance items off your homeowner to-do list. Practicing preventive care – both inside and outside your home – can save thousands of dollars in repairs come later this winter. What follows is a brief checklist to get you started. As a constant series of chores, home maintenance is a four-season job and one which should not be taken lightly. The tasks of each season are unique and this month is mostly preparatory in advance of colder weather. This entry was posted in Around The Home and tagged Around The Home,Home Maintenance Tips,Seasonal Home Tips by BJ Kirkpatrick. Bookmark the permalink.